If you want to work in a tax deed state and get bargain tax sale property, go ahead - attend a few auctions! Common sense will tell you that in every county in the country, there are investors with cash, and they're not about to let a $50,000 property get sold at an auction for $286.33. Sure, they may not pay full price, though I've seen it happen plenty of times (auction fever). If that property is truly worth $50,000, you can bet it will fetch a minimum of $30,000-$40,000 at the sale. And I don't know about you, but I don't like to sink that kind of cash into something I can't even inspect. After you get your tax deed, you cannot sell the property with title insurance to someone else. You must perform another costly legal procedure called a quiet title (and you may also have to evict anyone residing in the property). It's just not a good deal. Plus, aside from a few areas, tax deed sales happen infrequently, only once per year or so. Sorry to be so negative! We actually do lots of profitable deals in tax deed states. We can work states thousands of miles away, without traveling there. By combining the "Farming Tax Delinquent Property" strategy and the "DeedGrabbing" strategy, we can keep active all year long, not just once per year when there is a sale. We always have the right to inspect the property (though we'll send our prospective buyers to do it, BEFORE we agree to anything), and there's never any bidding - because it's just us one-on-one with the owner. By working with the owner of tax deed sale property BEFORE the sale takes place, we can get unwanted properties or properties that the owner has given up on - for as little as $50. -Run some cash buyers over and flip quick! Or pay the taxes and create a free-and-clear rental for yourself. 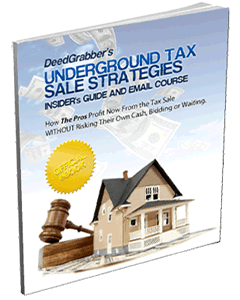 Get my insider's guide now for more details on how the tax deed sale game is done - by the insiders! In most states, you contact the county. A lot of times you'll see the lists posted online at the county's site. If not, call and ask when the next tax deed sale is taking place and get the list as soon as possible. You can also get a list from most counties of ALL the tax delinquent properties in the whole county, and sort them in Excel to find the people furthest behind. Rick , how are ya... I like to say I'm not to far from you. I'm on the border of Indiana Michigan and Ohio enough said Rick this has to be a great omen I attend a tax deed sale in Hillsdale today and it was crazy this ten acre with a small poll barn on it went for 49K taxes owed on it was 7700.00 I spoke with the tax assessor after the sale dump fondly I told him who I was just being noisey.. I said to him boy people go crazy on some this property, and ask Gary what do you do with the over bid money, well that another story and he took a ? from another person... I said thats a cheap way out. Rick your right I would like to find the quit way to buy these properties, and I look forward on more information from you. You get chance said me and email I would like to network with you. Well Robin, in Michigan the state keeps the money. In Ohio I believe it is available to the former owner. Goes to show someone lost a property worth minimum $49k when only $7k was owned, that would have been a perfect one to negotiate on upfront! So, I have done all this reading about tax sales and figure as a single parent this might be my way to home ownership here in CT. I am concerned that i don't have enough reserve capital to do this. Can you enlighten me as to how I can make this work for me? any information would be most appreciated. You might find a house for yourself. However I've found that most properties going through the tax sale process are quite run-down. Most of the ones that are very nice end up having a mortgage, though overall most properties going through the tax sale process DON'T. A better plan might be to flip some of these houses and use your profits to buy a property more conventionally. As you know if you've read my material, you'll have a much better chance of getting a good deal from the tax sale by contacting tax-delinquent OWNERS, not attending the sale itself and bidding. Sure, you could get a list of tax deed properties free online, locate the owners on the internet, contact them by phone, and get the property under contract. Then assign your contract to a cash buyer who would close with their own funds. That's basically what we show how to do in the Free and Clear Foreclosures program. Not sure where you're coming from - did you buy this property at the tax sale? If so, you need to do a quiet title. If you bought from the owner, you needed to have checked for a mortgage first - the mortgage is still valid against the property if you bought from the owner. Most properties nearing the end of the tax sale process have no mortgage, but it does occasionally show up. Give us some more details please.